– The Jungletek Queen returns to Brighton. It’s been too long. – The opportunity to bring one of the UK’s finest up-and-coming amen choppers down to the seaside was just too good to miss. – Forget words. This is breakcore that’s faster than thoughts. Precise, beautiful, devastating. – Rinsing, stomping, Jungle & Jungletek from one of the UK’s fastest rising underground producers. – What, these two again? 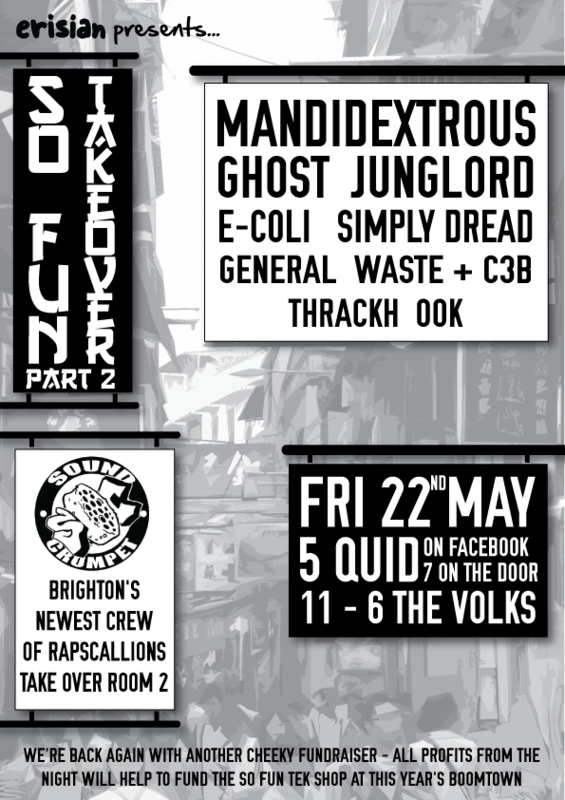 The Erisian & Community Payback Records residents combine their talents once more for the Volks crowd. – A man whose jungle and breakcore mixes create so much monkey business that his name is on every orangutang’s lips, guaranteed to get you moving and possibly swinging from the rafters. Brighton’s new kids on the block have been making longer established nights look over their shoulder in a worried manner for a while now – come witness as they tear Room 2 apart with all manner of banging tunes and raucous vibes. We like to keep these things cheap and cheerful when we can so if you stick your name on the Facebook wall for the event it’s just a fiver. Only your name though please, if your mates want to get a discount they need to do it too. For people who aren’t up to speed with where all the cool kids hang out these days and just turn up on the night, it’ll be £7. But you’re reading this so we both know that won’t be you, so I wouldn’t worry about it really. All profits from the event will go towards making 2015’s So Fun Tek Shop & DVD Emporium in Chinatown at Boomtown Fair​ even more amazing than last year. This means you can come and have fun at the Volks now, and as a result have more fun at Boomtown this summer. Perfect.